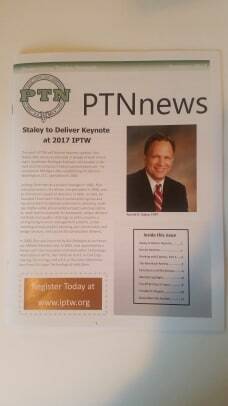 Steven Schuyler reports on the activities at PTN's meeting held in Detroit, September 8-10, 2017. 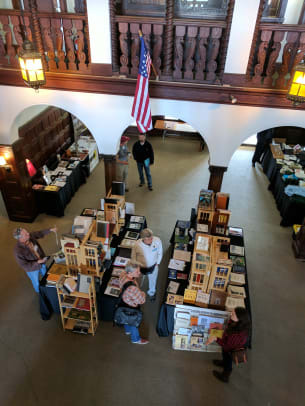 In my role as a purveyor of uncommon books for the building trades and professions, I’ve been the bookstore at Preservation Trade Network’s (PTN) annual meetings for a dozen years or so. Most of these have involved varying amounts of travel, in my Dodge cargo van, filled with scarce and out-of-print books for building tradesmen. And most of the travel has been with a ‘co-pilot’ to help navigate the route and keep the road trip interesting. 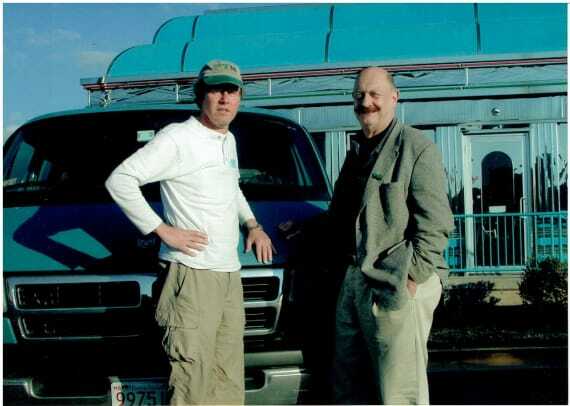 In my first couple of PTN events, my road trip wingman was usually preservation pioneer Clem Labine. I would pick Clem up in Brooklyn’s Park Slope district, and head down to the mid-Atlantic venues for PTN’s annual late summer gathering, called IPTW. Clem is a lifetime member and was keynoter at one of the early events. One of the photos is of me and Clem at a wonderful Greek diner in Frederick, Maryland, in front of “old blue,’ my cargo van of many years. This year’s IPTW was held in Detroit, September 8-10, 2017, on Belle Isle in the elegant Boat Club, and the theme was “Making It By Hand.” We had a long day’s drive ahead of us. One impression from many miles on I-90 is that we now have thousands of acres dedicated to grape vineyards, something that was not the case 20 years ago, and we have far fewer old barns alongside the road in upstate New York and Pennsylvania: good and bad developments of the last two decades! 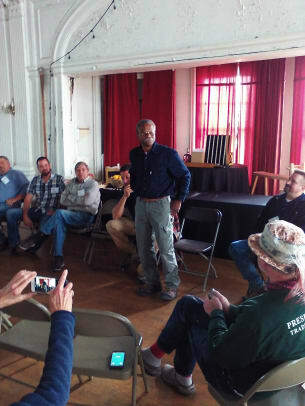 A little background on PTN and its annual meeting: the organization has been in existence for over two decades It sprang out of the desire of building tradespeople for an organization that addresses their specific needs for networking and education. The annual meeting, IPTW (the ‘I’ stands for ‘international,’ and the ‘W’ for ‘Workshops,’ i.e. 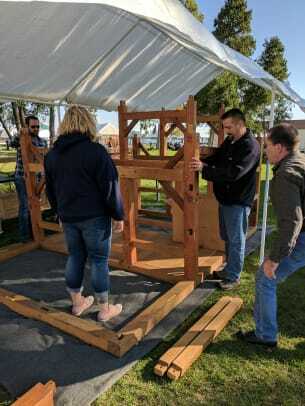 the meetings have had demonstrations from tradesmen from 20 different countries and the feeling of most of the sessions is definitely ‘hands-on.’) usually takes place in late summer or early fall. PTN has as its basic principle the notion that conservation of the built environment is fundamentally dependent on the work of skilled people in all the building trades. Membership in the organization is open to all, but includes, besides tradespeople, architects, conservators, engineers, home owners and many students of all backgrounds. Members are from all over the US, with several from the UK and Scandinavia, but PTN tends to be largely an East Coast organization. The annual meeting always has at least 150 attendees, but in cases of Mid Atlantic or Northeast venues, the attendee numbers can be much greater. The largest IPTW I ever attended was in Belmont College, in Ohio, where the nation’s preservation institutions co-located with PTN for a synergistic meeting of 4-5 days. We arrived at the Detroit Boat Club on Belle Isle Park bright and early on Friday, and I could immediately see ‘logistics’ problems. I always have a large amount of ‘drayage’ (books and bookcases are heavy!) and it was quickly apparent that I had two flights of stairs to climb to get to the central spot reserved for my bookshop. The elevator had not worked for decades, and I feared my move-in would take hours. But one of the four on-site organizers, Steve Stier, put my mind at ease quickly. When I asked why no one had bothered to inform me of the move-in ‘challenges’ he confided, “You might not have come to Detroit, and we all need a bookstore here! Not to worry: we will all help get your books moved in.” And I must admit, it was the quickest and easiest move-in of my bookselling career. They had everything up the stairs in 15 minutes, with an ‘all hands on deck’ approach, much like a barn raising! This was actually common at PTN events: we’re all in this together! The event has a predictable ‘beehive-like’ flow. There are as many as a dozen concurrent demonstrations going on all day long. 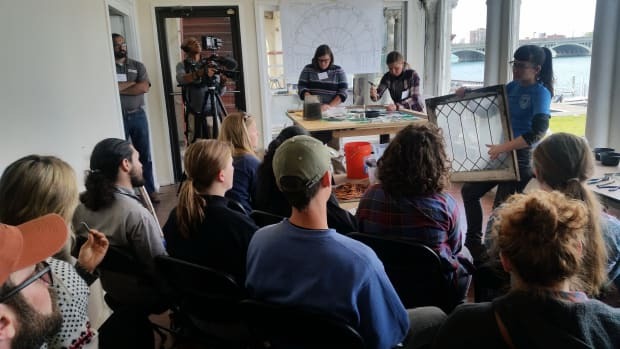 There were ten tent locations (brought by Professor David Mertz of Belmont College’s preservation program, along with a half dozen of his students) as well as three or four inside demo areas, and ten actual session times spread over two days. So several of the sessions were ‘in situ’ demonstrations, conducting needed repairs to the structure. Right in my area were two important sessions which would last several days: repairing the existing surface stucco failures (Portland Cement had been used to patch over softer brick material, resulting in failures). 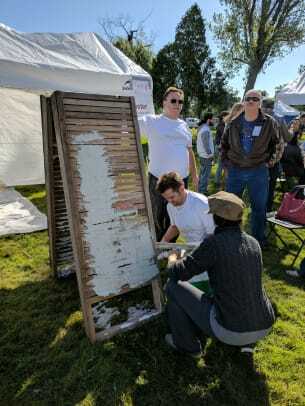 Demonstrator Blair Bates spent two days repairing and explaining his work on two facades which were in need of major attention. Another much needed repair was to the beautiful circular windows above the Great Room, where the dinners and presentations took place. 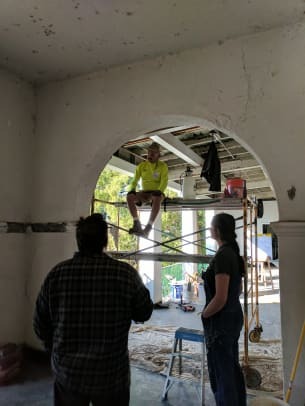 During the President’s Roundtable Discussion Friday afternoon, I spotted what to me looked like a ghost up in the waterside 4-ft. round windows (see photo of the restoration efforts). 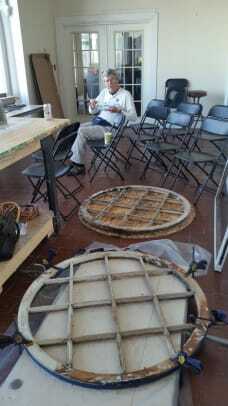 The windows were taken out and taken apart, stabilized and re-glazed. A fascinating process to watch, even to eat breakfast with – see photo! With so many demonstrations taking place, it is hard to point to too many of them. The entire event and schedule is available online at http://ptn.org/iptw-2017. My personal favorites this time were David Hayles’ demonstrations on “The Magic of Scagliola,” (he has also written a book on the topic), Vern Mesler’s outside demos on Riveting (“Using historic tools for the preservation of metal structures.”), the restoration work on the large circular windows from the facility, stone carving and a fascinating blacksmithing demo. Several of the pictures shown here convey the sense of commitment and skill and professionalism involved with all the demonstrations. Several aspects of the events are noteworthy. At the core of the event is a sense of personal pride in the skills attained in the various disciplines, and the desire to communicate this to peers. Secondly, is the serious effort made to involve younger members in the trades-learning process. I have seldom attended events like the IPTW that had as many young people among the attendees. As a professional bookseller, I wish we had a similar track record in the book trades! And, the building professionals do not work in an ivory tower. This year the group helped restore the Boat Club building. Past IPTW meetings have also been held in areas needing help After all the turmoil with flooding in New Orleans, the meeting was held in that city and restorations on several ‘shotgun’ structures in the Ninth Ward were undertaken by the group. At the end of the day’s events on Friday, there was an after-hours pub crawl, which gave us an opportunity to get to know our colleagues socially. But for me, the most important events of the three days take place on Saturday afternoon and evening. The first event is the conferring of the Askins Achievement Award, named in honor of Jim Askins, founder of the National Park Service Historic Training Center. It amounts to this year’s PTN all-star! This year’s recipient was James Turner, a Detroit native and himself an accomplished trainer and steel window restorer. Everyone was very happy for Jim, who was clearly very pleased to be this year’s recipient: well deserved! My other favorite aspect of the day’s activities is the auction, which takes place after the keynote (this year featured a thought-provoking talk by Ron Staley, FAPT, of Christman), dinner and happy hour. It is worth noting that each year, Andy DeGruchy, the owner of Pennsylvania-based LimeWorks, provides 4 or 5 varieties of home-brewed craft beers and has beer glasses etched with the event and venue for all present. I have collected a glass from 5 or 6 previous IPTWs. The auction is PTN’s way to fund its scholarships, for the next generations of preservation tradespeople. I always donate some interesting books for the event, many with ‘important’ provenances. Since I purchased the entire reference library of the magazine Old House Journal, initially started by Clem Labine from a brownstone in Brooklyn in the 1970s, I usually try to find and donate an ‘important’ copy from Clem’s library, which often attracts a premium price! My first PTN auction experience, the 2005 event, was most shocking. The first item that came up for bidding was a lot of two t-shirts from a previous IPTW (each year attendees get the year’s t-shirt, which I always covet for their durability and design!). Two charter members of PTN decided they had to have those t-shirts and the bidding surpassed $2,000. That year the auction resulted in close to $20k, all for the scholarship fund. 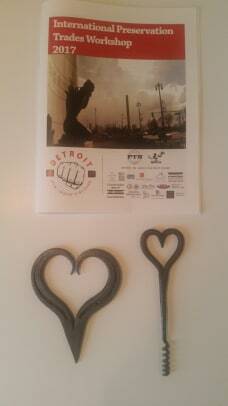 Along with donating a few items, this year I took a fancy to two items which the blacksmith had fabricated during his demonstrations. 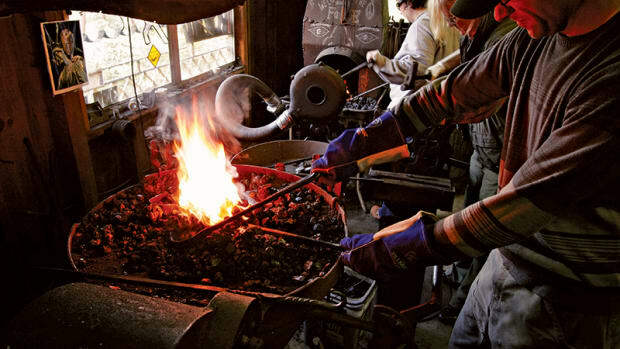 I am always looking for nice Valentine’s Day gifts for my daughters and the blacksmith demo produced two heart-shaped objects: a horseshoe turned into a heart, and a cork-screw with a heart-shaped handle. Another PTNer and I butted heads in bidding on these items, but all for a good cause, scholarships. Which brings me back to a basic tenet of the organization: recruiting and training a new generation of tradespeople. Several PTNers came by my booth and expressed their hope that more could be done to bring in greater numbers of students and apprentices. It is seen as an ongoing issue. But my sense is that it is a concern in most areas of development. David Mertz is the head of the preservation program at Belmont College in Ohio. He has always brought his students to these PTN events. In fact, he even brought his students to the Restoration & Renovation trade shows in the 1990s, figuring that his students’ next two employers were exhibiting or doing demonstrations. By volunteering, the students were given the opportunity to interview informally and learn a bit about the practical side of their training. All good things must come to a close. After the auction, the on-site team helped move my books (all ca 1,500 pounds!) back out to my van. The trip back was uneventful, except that I picked up a noted architectural historian’s library, in Buffalo, New York. It included 15 banker’s boxes of rare architecture books. He was happy to see them going back into circulation, for the next generation of historians and preservationists. I always find the IPTW experience to be uplifting and thought-provoking, for many reasons. Many of us are small business owners and the chance to visit with our peers and even competitors is worth the effort. There is also an opportunity to meet new people, possibly for hire, or to pass work projects on to. This year many of the PTN members, in conjunction with Monica Rhodes from the National Trust, spent an additional day organizing several hundred volunteers to clean up some brick buildings in Fort Wayne, near Detroit. Rumor has it that the next IPTW will be closer to the East Coast, possibly in Frederick, Maryland, again, at the National Park Service Training Center. Please consider joining the organization and attending this event. For up to date information on the organization, consult their web site: www.ptn.org. Steven Schuyler has a varied background that includes a few years as a college teacher, preceded by a tour in Vietnam in combat as a draftee in the Army (1970-71) and several years in Germany as an exchange student and a Fulbright Scholar. In the 1990s he was the co-owner of the Restoration & Renovation trade shows. 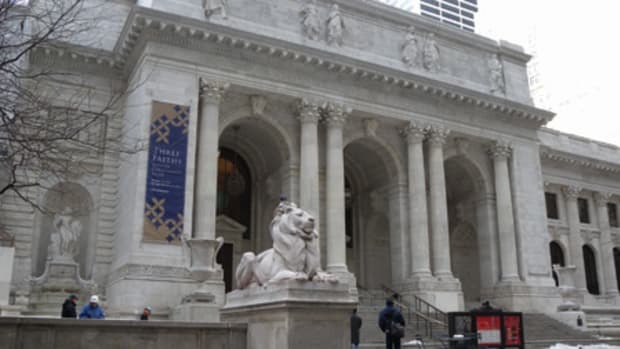 Since the late 1990s he has been a used-book seller specializing in books for the building trades and professions. His website www.rarebookstore.net features thousands of books and visually interesting material for the building professional or the DIY period homeowner. Steve can be reached by email at rarebookstore@comcast.net. Where do you go to learn the trades needed to preserve historic buildings? Various schools and programs around the country offer hands-on training. 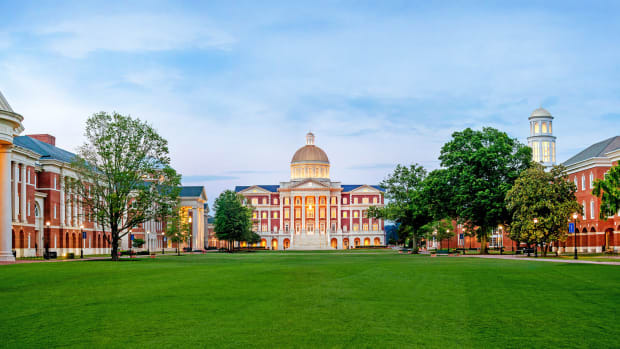 The Washington Mid Atlantic chapter of the ICAA has announced 13 John Russell Pope Award winners for 2017. A noted architectural educator refutes the common arguments Modernists use to dismiss contemporary traditional architecture.